….. reporting live…. reporting via reporters…. whatsapp… facebook….we’ve HAD this covered in 2016…. and watch out 2017… we going BIG!!! An event does not just happen overnight, and hence we decided that the “begging” needed to start a lot earlier… and boy oh boy… what a fantastic response we received! Email after email was sent to various companies, people, labels, facebook advertisements etc etc… we were never disheartened by any “no, sorry, we cannot help response”, as for every negative, there was an equal and opposite positive! If you spotted us walking down the shopping aisles and just snapping labels – well, thats how we roll!! The Westville Cycle club once again handled all the “admin” side of the event – from entry fees, to logisitics, to pretty much making sure that the event was happening!! 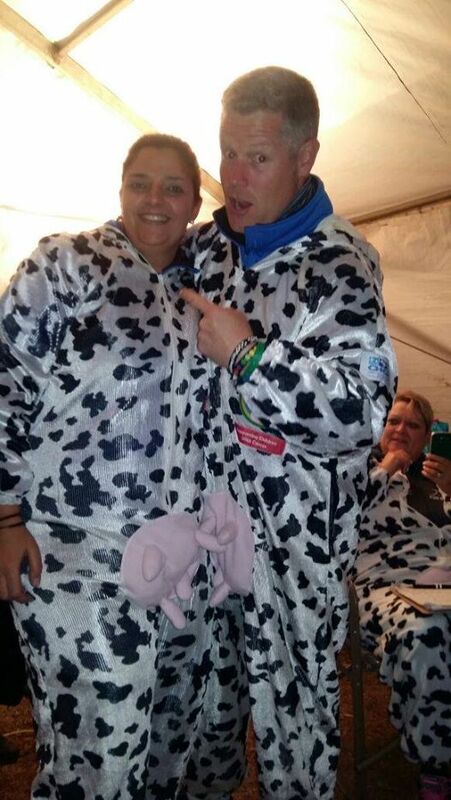 It takes team work to put on an event of this nature… and standard… and so various Bovine’s were sent on some “Secret Missions” once we had received some firm commitment of sponsorship – be it goodie bag goodies or raffle prizes. Secret Mission #1 was a visit to a “make-over place” and after nearly being locked up and denied bail for distressing the staff whilst waiting for the vouchers the Cow managed to escape in an udderly orderly fashion. Secret Mission #2 was dropping off the cow medals and meeting Mr Richard the engraver who took great delight at pulling all the ribbons from said medals… returning to us a very heavy box of Cow Medals, whilst he was overflowing with cow print ribbons and a bit of metal. Not highly amused … but we managed to flex our “fore-quarter”… ok ok and hind quarter and return to the car….!! Secret Mission #3 was an absolutely pleasure. Giba Gorge. Vague memories of once upon a time cycling there and being quite impressed with all the changes made at the bike park. The level of enthusiasm grew when no bike was required whilst sitting down for some yummy Afros… I love missions like this… grazing is a must!! Secret Mission #4 was a little less amusing as it involved traffic in Pinetown, potholes, and a lengthy wait in the blazing sun. The little Polo was over loaded with yummy cold drinks and water none of which authority was given to be opened…. At 45.256km an hour the Polo scraped most of the tarmac on the way home, it became a rather arduous secret mission to say the least. Secret Mission #5 was the trip back to the Medal man, who had done a sterling job – for free!! The dreaded chapter awaited…. That part entailed threading 125 ribbons back into the medals on a Wednesday evening, medals everywhere and all sorts of pinching tools around to help pull the ribbons through tiny tiny little holes (nothing wrong with the eye sight cough cough). Having some of the ribbons mysteriously tangling themselves up in the box was a true tester of patience…alas, the medals survived… and so did a Cow…. Secret Mission #7 – saw a meander up to the local dairy… well…. Midmar local… for some delicious flavoured milkshake… always a hit with the cyclists! This year we were incredibly spoiled to have both our goodie bags and long sleeve t-shirts sponsored. We basically took over – did our thing – sent for various sign offs, and for once… told Kelvin – this is it for 2016! No questions taken… never mind being asked! The bags and shirts were a massive hit, and cyclists even wore there shirts on a few of the stages of Gabran. It was finally time to pack the much awaited GOODIE BAGS! A few trips up the hill to the local Barnyard… and we were all systems go go go…. Naturally we had a very very professional photoshoot with the products for our fabulous sponsors… for a small fee… we are willing to share the duds…. We were still very blessed by all the products that we had received over the last few months – each and every product being something “cyclist friendly…” meaning it could be eaten or used at the Gabran! Last Minute Dot Com always arrives, and the final packing of the sponsored truck, collection of marquees, tables, chairs and goodie bags was done! And onwards they headed up to ATKV in the Drakensville. Thursday evening’s excitement was seeing previous year’s Gabranners ready to tackle Gabran 2016! The scenes at the ATKV resort was most festive, and many enjoyed the buffet for dinner…. that sweet potato was a definite hit!! Friday registration started at 6h30 with some very eager beavers ready to get their fantastic goodie bags, their “klip or klap” meal wristband and the blue…SHIRT! The well known event t-shirts have taken Gabran to a new level with people being absolutely in awe of them, very different, very trendy and were well worn throughout the event. Roughly 115 cyclists started the morning and very few cyclists bailed during the ride. The main bailing point came after the famous Estcourt Bowling Club where arm muscles were tested and thirsts were quenched. Special mention needs to be made of the MTB club members who would not give up and participated till the very end, even if one of them had to be bribed with a beer as the hills kept rolling and rolling into Escourt. 1st time GABRAN participants took to the WATERS at Wagondrift… as part of initiaition… wonder if now is a good time to tell them… “SUCKERS!” A certain group, always initiate their newbies… and this year was no different – a full body submersion was required… and on exiting… HUGS were exchange with anyone within a 50m radius! Well done all for braving the CCCCCold Water! As is tradition, on Friday night we have a little fun raffle on the go for cyclists only and all those present with prizes ranging from various cycling vouchers and gloves right down to fun magic bubbles which we are sure would have been a hit at Midmar dam… if the weather behaved. We also had live entertainment by Graham Boyle and some karaoke once again for those who can sing, those who think they can sing, and the guarantee of sore abs tomorrow from the laughter… KPCC member, Paula, did not disappoint with some great dance moves, and entertaining the “audience”. Not to be outdone, Cavin took to the floor and joined his mom…. There was lots of laughter all around and people are having a glass or 2, 3, 4, 5 to drink! Eventually we all went off to bed at a reasonable hour…. as the cyclists knew what was waiting for them on DAY 2… “the hills are alive with the sound of….. CLICKING GEARS/GRANNY GEARS!! !” Some decided to “star gaze” for an hour.. before the chill factor really set in, and then they all climbed back into their own tents… and just as well, as at 2am the rains came down… in hindsight… maybe we should call that “rain” drizzle…..
Day 2 started of very early, dark and wet after some overnight rain…storm. The main tent was taken down at 5h30 to be taken to Midmar to be set up on time for the hungry cyclists’ arrival. The atmosphere was once again fantastic even though it was rather chilly for such an early start. Another awesome cooked breakfast was served with bacon, eggs, sausages, potatoes, fruit salad, yoghurts, muesli and steaming hot oats. Tea, coffee, Milo, coffee and some more coffee was also ready to be abused by all. The first climb of the morning started immediately with the cyclists having to climb out of Wagon Drift Dam on what is known as the Concrete Road. Many cyclists were seen trying to sneak into vehicles to make the summit of the first hill. Little did they know what was waiting for them just outside of Estcourt…..Bacon Hill… the second climb of the day… The group was well split up with enough spaces and gaps for traffic to flow freely and lots of waves and smiles, and toot toots were heard along the route. More “clever” cyclists decided to not only catch a lift to the top of the concrete road, or Bacon Hill but rather to Griffin’s Hill.. to the top… the very top… where the tower is that indicates…the top!! After Griffins the roll down into Mooiriver was enjoyed by everyone. Our traditional stop at the Engen/Wimpy turned out to be a hit once again with all the cyclists ready for second breakfast! We took over the Wimpy for at least 1 hour… bacon/ eggs/ muffins/ coffees/hot chocolates… were just a few things on order. Having refuelled…the cyclist had another surprise waiting…..you guessed it another massive uphill climb. It was incredible to witness cyclists helping each other along, a hand in the back for the ones with tired legs and lots of encouragement! On top of this hill… they met the Merry Bovines… who got merrier and merrier as more summitted this climb… or as they downed a few more sherries cheering every cyclists on their way down…. Once at the top they knew it was downhill all the way to Midmar with the compulsory stops along the way. Some stopped at the Sherry Tasting site. They convinced a few back up- drivers to stop there too…by default. The sherry was really phenomenal… in a wine glass. A fire burnt inside, and warmed up the cyclists as they continued to enjoy a refreshment. The first cyclists at Bierfassl, left early and also arrived first at Midmar Dam…. Dry. However the later arrivals also departed the Beerfassl later (logical really) and arrived at Midmar…SOAKED!!! They got caught in a torrential down pour. However, nothing dampened their spirits!! An incredible HOT lunch was served yet again consisting of oxtail, pasta, meatballs, 3 cheese macaroni – a warm welcome treat for all the cyclists at Midmar dam. Live entertainment was yet again provided by Graham and he got the crowd up dancing, having dance offs and even the children got up there and did their thing – after being coached by Jimmy Shankland. The “Ballies” gave us a rendition of “Always look on the bright side of life…. whistle whistle whistle….” and John Campbell gave us his version of Ryperd… what is Gabran without Ryperd…. Well well well… day 3 dawned … and we were rather surprised to see that there were still some tents (albeit lonely tents) standing…. despite being drenched! Those that braved the camping, got in a bit of Midmar Mile 2017 practise. The weather remained ominous, with many “phoning home” to check on the weather and then deciding to bail… and return to Hillcrest via 4 wheels… undercover! However the “dark and cloudy” skies soon cleared and it was a brilliant day to be out on the bike! Watching from “behind the Land Rover wheel” was special – seeing the “peletons” being pulled up hills and team work all round. The youngsters rode under the watchful eye of Werner Moolman and Greg Steadman… watch this space … Gabran is making Olympians! The route on day 3 is Midmar back to Hillcrest – and the famous downhill in Maritzburg is a firm favourite (and you hope like heck your brakes will work!!) Fast, windy and apparently FUN! From Maritzburg the route home is Amashova – with the option of Polly Shorts as an alternative to Fox Hill. This is well known territory for many cyclists as they start making their way down to Hillcrest. On arrival at the Club, each participant was awarded a Cow Medal and they proudly displayed it… and rightly so, as we are both proud and greatful for the difference that they have made by joining our event! For the first time, we also have some “live coverage” of the event, with various video clips being sent to MOO-MEDIA Central during the course of GABRAN and this proved to be a winner. Not to mention an assortment of many many photographs that captured just a small portion of the event in reality – the only way to experience it, is to do it! As our slogan now goes… GABRAN – It is not a Race.. it is an Experience! Thank you to all those that contributed “evidence” to the secret Moo at MOO MEDIA Central!! We have uploaded many videos and photographs (and maybe incriminating evidence) on our Face Book GABRAN CHOC COWS – so when you have an hour or ten to spare – go take a look – tag your friends and yourself – and lets get those numbers up for GABRAN 2017… provisional date will be the 18th, 19th 20th August 2017. There are so many people to thank, companies to thank and the list goes on – and individual thank you’s will be sent to them in good time! Once again, MANY thanks to the Westville Cycle Club, and especially Kelvin and Corinne for all they do for the Club, The Cows and Cycling. Without their passion and drive many events would not take place! THANK YOU THANK YOU THANK YOU!